The UN Security Council has unanimously condemned North Korea’s latest missile test and warned of new sanctions. In a statement, the 15-member Council demanded that Pyongyang conduct no further such tests. North Korea earlier said the missile it had tested on Sunday was a new type of rocket capable of carrying a large nuclear warhead. The missile travelled some 700km (435 miles), reaching an altitude of 2,000km and landing in the sea west of Japan. South Korea’s military said it could not yet verify the North’s claims. But it said Pyongyang’s missiles did appear to be able to leave and re-enter the atmosphere, which is crucial to developing intercontinental ballistic missiles (ICBMs), South Korea’s Yonhap news agency reports. What do we know about North Korea’s new missile? In the statement on Monday, the UN Security Council stressed on the importance of North Korea “immediately showing sincere commitment to denuclearization through concrete action”. Pyongyang should “conduct no further nuclear and ballistic missile tests”, it said. Earlier on Monday, North Korea’s KCNA state news agency said the test of a “newly developed mid/long-range strategic ballistic rocket, Hwasong-12” had gone to plan. 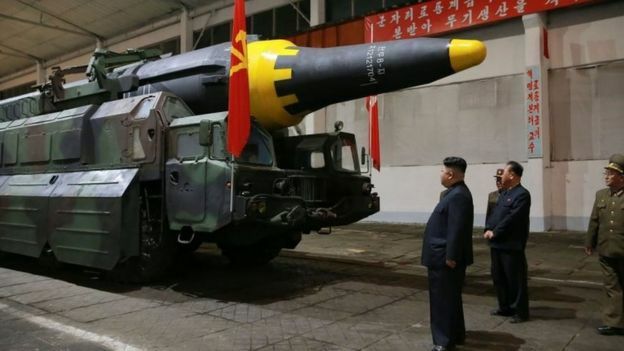 But it remains unclear whether it has the ability to make the weapons small enough to be mounted on a rocket, and it has never tested an ICBM which could reach, for example, the US. 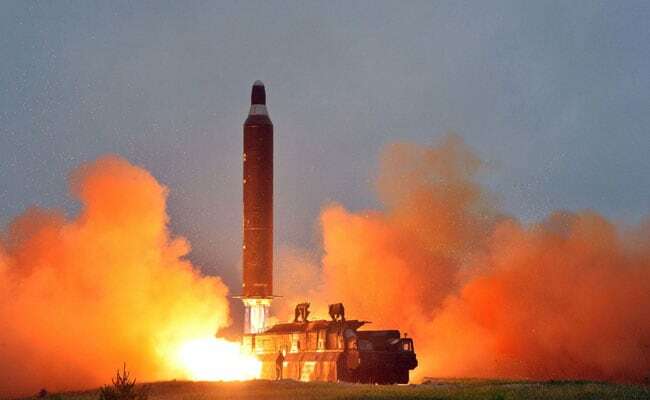 ICBM’s are considered to have a range of about 6,000km, but analysts believe the missile tested on Sunday would have travelled about 4,000km if it had been fired at a standard trajectory rather than upwards. The KCNA report said that, as ever, the test had been overseen by the North’s Supreme Leader, Kim Jong-un. It said he had told the scientists and technicians involved “not to be complacent” but to build further “nuclear weapons and methods of delivery” until the US made “the right choice”. But in a statement on Sunday, it said Pyongyang had been “a flagrant menace for far too long” and that this “latest provocation” should “serve as a call for all nations to implement far stronger sanctions”. The US ambassador to the UN, Nikki Haley, said on Sunday that until Mr Kim met the US conditions, “we’re not sitting down with him”. South Korea’s newly elected President Moon Jae-in, who is seeking deeper engagement with the North, said it was a “reckless provocation” while China, North Korea’s only real ally, is urging restraint.